Spot the difference on the screens below. If your answer was ‘the devices’, ‘the images’ or ‘the subscription packages’... well, clearly you’d be right. But the key difference is that they’re designed to be shown to very different users. All of these screens are upselling a user to the premium service of a streaming provider, but each of these screens have been created to suit a very specific segment of users, and have been optimized to maximize the likelihood of that specific audience signing up to become a valuable paying customer. Battling to increase your number of Daily Active Users is all well and good, but if those users aren’t paying their way then that number loses its importance. 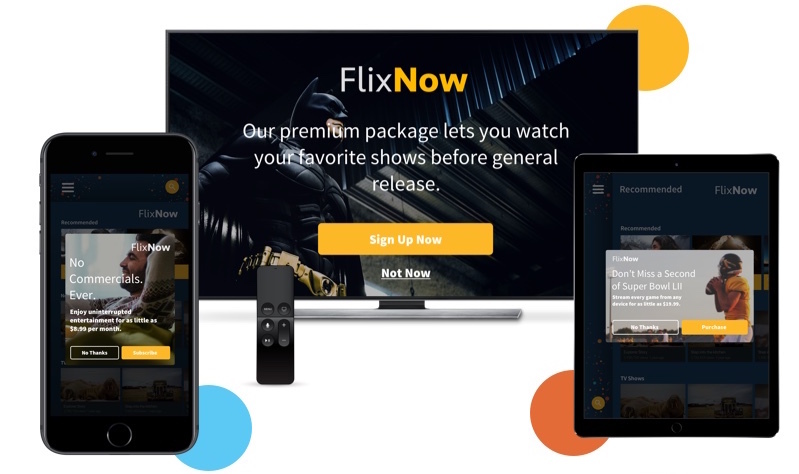 For example, in the OTT and streaming world, converting free users into paying accounts is not just a constant challenge but also the key to success: and segmentation can be incredibly important in making that happen. Just as the users who will be seeing these conversion messages will be a very varied bunch, so too should the screens you show them. We’ve all come to expect personalization from the apps we engage with, and an offer tailored to a user’s habits is far more likely to achieve success. ‘But how do we segment effectively when we have millions of users, each doing their own quirky things?’, you may well ask. Well, the answer is that obviously it’s out of the question to sit down with each and every user, have a long chat and get to know them well enough to buy them a birthday present. But what you can do is segment or profile your user base. By using the right metrics to form small, specific groups who are then shown certain messages, your users will feel like that message is specifically for them. Even better, reacting to customer behaviours in real-time ensures that your app feels more like an ongoing conversation than a traditional ad campaign. Let’s take a few examples. Behind the same screens that we’ve just looked at are three fictional users who are each approaching FlixNow in a distinct way. Other than their music-themed names, these individuals have very little in common. 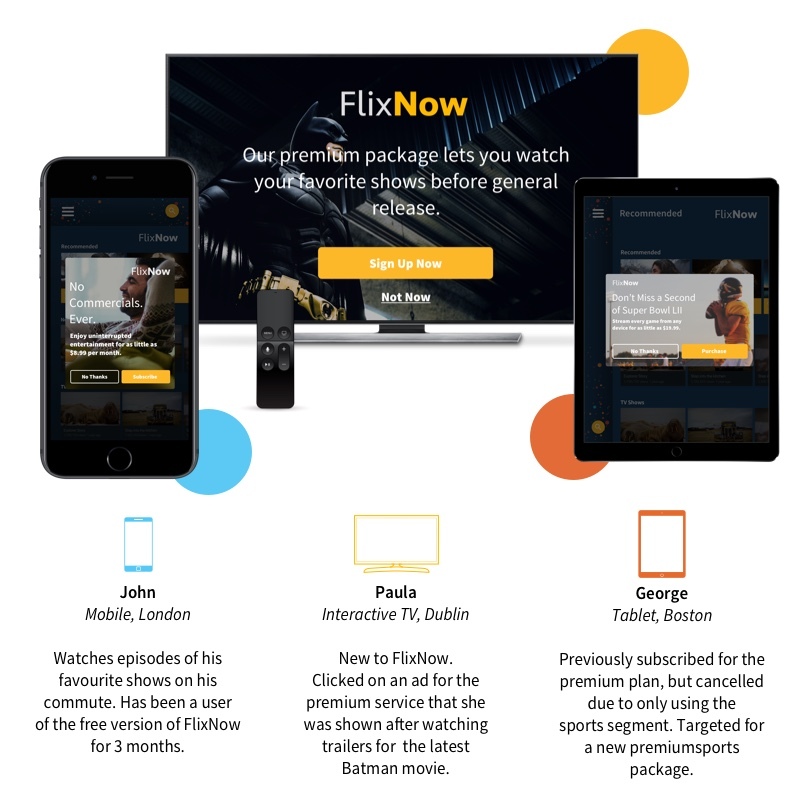 If Screen 3 was shown to Paula rather than George, for example, she would be likely to click away from FlixNow entirely thanks to the irrelevant offer she was being shown. Who: Having an understanding of the demographic of your app in general, and of certain features specifically - including age, gender, and popular interests - can help inform decisions about what’s most likely to appeal to them. When it comes to accessing internet or apps on a tablet, for example, only 41% of millennials use them each week in comparison to 55% of Generation X. Knowing who you’re likely to be speaking to helps define your audience. What: Taking into account what device is being used affects more than just the practicalities of fitting messages to certain screens. Studies show that people engage with devices in different ways, from the times of the day when engagement peaks to the different genres that users of each device favour. Different devices often mean different motivations; and user behaviours and preferences reflect that. Why: Why are they being shown this message? Noting whether the user has been sent to this screen by an ad or been deep-linked through from a push message ensures you know what they’ve already seen, and whether they’ve initiated the action. Data that records both where they’ve just arrived from and the relevant interactions they’ve had in the past are vital to ensuring that they’re being shown what they were expecting. Where: Localization is about more than just translating language. People from different cultures respond to different tones of voice, and certain images that hold cultural currency in some places mean almost nothing in others. Areas of interest can vary drastically too - particularly with a sector like media, using what’s popular in the user’s location ensures that they won’t want to be left behind. When: At what point in the lifecycle of app use is the individual you’re targeting? Knowing whether a user is clicking into the app for the very first time or if they’ve been using the free version for months allows you to judge how much information they’ll need to make a decision, and whether it’s worth presenting them with an offer. Some users may have previously been paying users, so could need extra resources to draw them back, but putting a discount in front of a user who was likely to start using the service anyway isn’t a wise use of either budget or time. Segmenting according to so many pieces of data can seem like a big task, but this is where an automated platform will do the legwork for you. By using Boolean logic to filter on multiple levels, users can be automatically segmented according to status, profile, demographic or device data, and by endless variations on these to suit your apps and your users. Take the message we created for George above as an example. 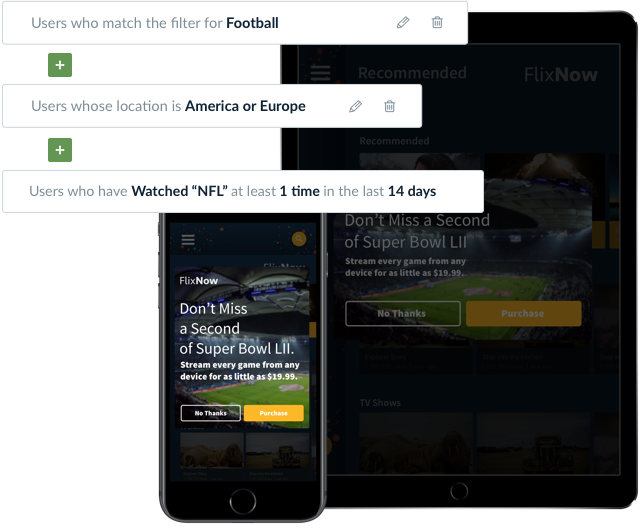 By creating a segment of users who are regular football watchers, who are based in America or Europe, and who have watched NFL in the last two weeks, you can filter your audience in a sufficiently specific way that the message you send to them will seem bespoke. A/B testing allows you to split groups even further in order to trial different formats for your message, and to get clear data on which version received the higher conversion rate. Filtering users by a mixture of different factors is more effective for drawing a complete picture of target groups than using several of the same. For instance, filtering by gender, location, device and behaviour will produce a group of relatively similar individuals. Looking only at interests, however, and filtering by ‘football’, ‘rock music’, ‘Stranger Things’ and ‘1980s gangster films’ will certainly result in a niche grouping, but one about which you really know very little. Ultimately, of course, establishing which elements and combinations of data make sense for your app is a matter of knowing your audience, deciding on your objective, and making sure your process is reliably automated, so that you can be sure every John, Paula or George is catered for.